ACE Inhibitor: A type of drug used to lower blood pressure. Studies indicate that it may also help prevent or slow the progression of kidney disease in people with diabetes, especially those who have protein (albumin) in the urine. Acetone: A chemical formed in the blood when the body uses fat instead of glucose (sugar) for energy. If acetone forms, it usually means that the cells do not have enough insulin, or cannot use the insulin that is in the blood, to use glucose for energy. Acetone passes through the body into the urine. Someone with a lot of acetone in the body can have breath that smells fruity and is called "acetone breath." Acidosis: Too much acid in the body. For a person with diabetes, this can lead to diabetic ketoacidosis. Acute: Happens for a limited period of time; abrupt onset; sharp, severe. Adverse Effect: A harmful result. Alpha Cell: A type of cell in the pancreas (in areas called the islets of Langerhans). Alpha cells make and release a hormone called glucagon, which raises the level of glucose (sugar) in the blood. Beta cells: The cells located within the islets of Langerhans of the pancreas that secrete insulin. The process leading to Type 1 (insulin-dependent) diabetes appears to start when the immune system recognizes and attacks proteins on the surface of the beta cells, possibly mistaking them for proteins on an invading organism. B.I.D. : Twice a Day This is a term used by medical professionals. Usually referring to how many shots are given a day or pills taken per day. Blood Fasting: A blood sample is drawn in the morning before the animal has eaten. Blood Glucose: The main sugar that the body makes from the three elements of food-proteins, fats, and carbohydrates-but mostly from carbohydrates. Glucose is the major source of energy for living cells and is carried to each cell through the bloodstream. However, the cells cannot use glucose without the help of insulin. and in the cat from 3.4 to 5.7 mmol/l(61.26 to102.7) (fasting). In cases of potential diabetes mellitus, the value is 5 - 7mmol/l. (90 to 126). The renal threshold is 10 mmol/l. (180.2 for conversion) Blood glucose levels which exceed this threshold result in excretion of glucose in the urine(glucosuria). In cases of clinical diabetes mellitus, blood glucose levels of 10 mmol/l(180) and higher are found. specially coated strip containing a fresh sample of blood is inserted in a machine, when then calculates the correct level of glucose in the blood sample and shows the result in a digital display. blood, usually taken from the fingertip(on a human) is placed on the end of a specially coated strip, called a testing strip. The strip has a chemical on it that makes it change color according to how much glucose is in the blood. A person can tell if the level of glucose is low, high, or normal in one of two ways. The first is by comparing the color on the end of the strip to a color chart that is printed on the side of the test strip container. The second is by inserting the strip into a small machine, called a meter, which "reads" the strip and shows the level of blood glucose in a digital window display. Blood testing is more accurate than urine testing in monitoring blood glucose levels because it shows what the current level of glucose is, rather than what the level was an hour or so previously. injection, and at regular intervals throughout the day, the level of glucose in the blood is determined through laboratory testing. Blood Urea Nitrogen (BUN): A waste product of the kidneys. Increased levels of BUN in the blood may indicate early kidney damage. Kidney Disease can be a complication of diabetes. Brittle Diabetes: A term used when a person's blood glucose (sugar) level often swings quickly from high to low and from low to high. Also called labile and unstable diabetes. Carbohydrate: One of the main energy nutrients. It supplies energy for the body and is further divided into simple carbohydrates (sugar, fruit) and complex carbohydrates (vegetables, starches). Carbohydrates are found in all fruits and vegetables, all grain products, dried beans and peas, milk and yogurt. 1. Starch: Complex carbohydrates such as vegetables, pasta, whole grain breads and cereals. 2. Sugar: Simple carbohydrates such as table sugar, honey, the four sugars listed below, and others. 3. Fructose: The type of sugar found in fruit. It does not require insulin in order for the body to use it. 4. Glucose: The main type of sugar found in the blood and urine. It is this sugar that is elevated in people with diabetes. Table sugar is half glucose. 5. Lactose: The main sugar found in milk. It needs insulin to be used completely. 6. Sucrose: Table sugar or "granulated sugar"-the body breaks it down to glucose and fructose. The glucose needs insulin to be used. Cataract: Clouding of the lens of the eye. 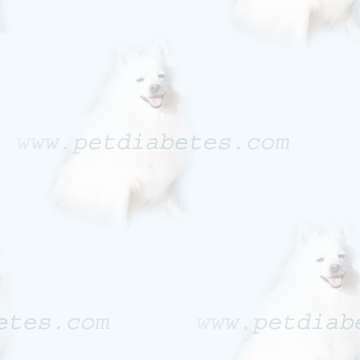 In people or pets with diabetes, this condition is sometimes referred to as "sugar cataract." Not all dogs suffer diabetic cataracts, while others do. It is the 'luck of the draw' and can happen no matter how quickly they are brought under control. Not a common occurrence in cats - typically only canines. An early exam by an eye vet is recommended 'before' any trouble starts, so the eye vet has a baseline to work from. If they wait until the cataract matures, the eye vet can't see into the eye to make sure there is no damage to the retina. If there is, cataract surgery will do no good in restoring the eye sight. Queenie was diagnosed over seven years ago in April of 1995 and only this past December 2001 has cataracts started to form. Dr. Bob feels they are old age cataracts and not related to her diabetes though she is not a candidate for any kind of elective surgery due to congestive heart failure and her asthma. She has about fifty percent of vision at this time. Touch Wood. Some canines; unfortunately go blind almost immediately. See Progressive Retinal Atrophy (PRA) and Dry Eye for additional information about eyes. nervous system (neuropathy), and the kidneys (nephropathy). Studies show that keeping blood glucose levels as close to the normal, nondiabetic range as possible may help prevent, slow, or delay harmful effects to the eyes, kidneys, and nerves. Counterregulatory Hormones: Hormones that work against the action of insulin, raising blood glucose levels in response to hypoglycemia (low blood sugar). The main counterregulatory hormones are glucagon, epinephrine (also known as adrenaline), cortisol, and growth hormone. C-peptide: "Connecting peptide," a substance the pancreas releases into the bloodstream in equal amounts to insulin. A test of C-peptide levels shows how much insulin the body is making. need to monitor their blood glucose during the night. If blood glucose levels are rising, adjustments in evening snacks or insulin dosages may be recommended. Diabetes Insipidus: A condition characterized by frequent and heavy urination, excessive thirst, and an overall feeling of weakness. This condition may be caused by a defect in the pituitary gland or in the kidney. In diabetes insipidus, blood glucose levels are normal. Diabetic Coma: A severe emergency when a pet or person is not conscious because the blood glucose (sugar) is too low or too high. If the glucose level is too low, the person has hypoglycemia; if the level is too high, the person has hyperglycemia and may develop ketoacidosis. Diabetes Mellitus: A condition characterized by hyperglycemia resulting from the body's inability to use blood glucose for energy. In type 1 diabetes, the pancreas no longer makes insulin and therefore blood glucose cannot enter the cells to be used for energy. In type 2 diabetes, either the pancreas does not make enough insulin or the body is unable to use insulin correctly. The signs of diabetes include having to urinate often, losing weight, getting very thirsty, and being hungry all the time. Pets with untreated or undiagnosed diabetes are thirsty and have to urinate often because glucose builds to a high level in the bloodstream and the kidneys are working hard to flush out the extra amount. Pets and people with untreated diabetes often get hungry and tired because the body is not able to use food the way it should. See Cataracts and Progressive Retinal Atrophy for more information concerning eyes. 1. Polyunsaturated fats: Fats found mainly in vegetable oils. 2. Saturated fats: Fats found mainly in animal foods. 3. Monounsaturated fats: Fats that have one double bond. It is high in olive and canola oils. When large amounts (3 Tbsp) are consumed each day, blood cholesterol levels will be lower. 4. Cholesterol and Triglyceride: Fats present in foods and in our bodies. High cholesterol and triglyceride blood levels for many years are a cause of "clogged" blood vessels and heart attacks. Fiber: The parts of plants in food that are not absorbed by the body. A substance found in foods that come from plants. Fiber helps in the digestive process and is thought to lower cholesterol and help control blood glucose (sugar). The two types of fiber in food are soluble and insoluble. Soluble fiber, found in beans, fruits, and oat products, dissolves in water and is thought to help lower blood fats and blood glucose (sugar). Insoluble fiber, found in whole-grain products and vegetables, passes directly through the digestive system, helping to rid the body of waste products. I add raw oat bran to Queenie's food for additional fiber and others on the list use canned pumpkin. Many vets will recommend a high fiber dog food such as science diet w/d for diabetic pets. Fructose: A type of sugar found in many fruits and vegetables and in honey. Fructose is used to sweeten some diet foods. It is considered a nutritive sweetener because it has calories. Fructosamine: This is a simple blood test that measures the average glycemic (glucose) control over a period of several weeks. This test covers only a 2-3 week period in canines, 1-2 weeks in cats. The test shows how much glucose has bound to the proteins in the blood. The specific proteins that are tested in this test only have a span of 2-3 weeks. Not good to adjust insulin, just a means of monitoring overall control. If a dog is rebounding, the test can show an 'average' reading due to the high and low swings caused by the rebounding, but consistent highs show lack of control. Glipizide: An oral medication that can be used to control blood glucose levels in some diabetic cats who still have some insulin production. sometimes used to treat insulin shock. The glucagon is injected and quickly raises blood glucose levels. See also: Alpha cell. Glucose:A simple sugar found in the blood. It is the body's main source of energy; also known as dextrose. See also: Blood glucose. Glycemic Response: The effect of different foods on blood glucose (sugar) levels over a period of time. Researchers have discovered that some kinds of foods may raise blood glucose levels more quickly than other foods containing the same amount of carbohydrates. Glycogen: A storage form of glucose in the body. Glycosuria: Having glucose (sugar) in the urine. monitor overall control. You can get an average reading with a rebound situation, but consistent highs show lack of control. Honeymoon Phase: temporary remission of hyperglycemia that occurs in some people newly diagnosed with type 1 diabetes, when some insulin secretion resumes for a short time, usually a few months, before stopping again. Cats tend to honeymoon ... unfortunately canines don't. into energy. Signs of hyperglycemia are a great thirst, a dry mouth, and a need to urinate often. For people or pets with insulin-dependent diabetes, hyperglycemia may lead to diabetic ketoacidosis. Hyperinsulinemia: A condition in which the level of insulin in the blood is higher than normal. Caused by overproduction of insulin by the body. Related to insulin resistance. Hyperlipidemia: Higher than normal fat and cholesterol levels in the blood. Hyperosmolar Hyperglycemic Nonketotic Syndrome (HHNS): An emergency condition in which one's blood glucose level is very high and ketones are not present in the blood or urine. If HHNS is not treated, it can lead to coma or death. Hypoglycemia: lower than normal blood glucose level (a Medical Emergency that needs immediate administration of a fast acting glucose. In diabetic animals treated with insulin there is some risk that hypoglycemia may occur. A dog or cat to may die of this condition and owners should be appropriately warned and trained by the veterinary team responsible for their pet's management. twitching, convulsions, coma and death. I think my pet is having a Hypoglycemic episode, what should I do? administered orally. There are also 20 and 40% dextrose (a form of glucose) solutions available for the veterinarian to use in emergency treatment. Or carry those little tubes of icing found in grocery stores. Injection: Putting liquid into the body with a needle and syringe. A person with diabetes injects insulin by putting the needle into the tissue under the skin (called subcutaneous). Other ways of giving medicine or nourishment by injection are to put the needle into a vein (intravenous) or into a muscle (intramuscular). Insulin: A hormone produced by the pancreas which is necessary for glucose to be able to enter the cells of the body and be used for energy. Insulin Resistance: A condition in which the blood glucose level remains higher than it should at an insulin dosage of 2 units/pound of body weight per day in cats. Ketoacidosis: A life-threatenting condition in which ketones, which result from the breakdown of fat for energy, accumulate in the blood stream and the pH of the blood decreases. remove both. The higher the ketones and unused glucose levels, the more urine must be produced and the body will become dehydrated. What are signs of ketoacidosis? A hard time paying attention, or confusion. Ketonuria: A condition occurring when ketones are present in the urine, a warning sign of diabetic ketoacidosis. Lancet: A pointed piece of surgical steel encased in plastic, used to puncture the skin on one's finger (or other body part) to get a blood sample. Lancet Device: A lancing device uses a spring to drive the lancet into the skin and retract it very quickly. It also allows the user to change the depth of penetration depending on the thickness of the skin and calluses and the sensitivity of the fingertips. In this way, enough blood can be obtained without causing unnecessary pain. A lot of owners don't use the device but just the lancet to obtain a blood sample because some dog's skin tend to be thicker then humans and the device doesn't insert the lancet deep enough. mg/dL: milligrams per deciliter, a unit of measure that shows the concentration of a substance in a specific amount of fluid. In the United States, blood glucose test results are reported as mg/dL. Medical journals and other countries use millimoles per liter (mmol/L). To convert to mg/dL from mmol/L, multiply mmol/L by 18. Example: 10 mmol/L × 18 = 180 mg/dL. mmol/L: millimoles per liter, a unit of measure that shows the concentration of a substance in a specific amount of fluid. In most of the world, except for the United States, blood glucose test results are reported as mmol/L. In the United States, milligrams per deciliter (mg/dL) is used. To convert to mmol/L from mg/dL, divide mg/dL by 18. Example: 180 mg/dL ÷ 18 = 10 mmol/L. Nephropathy: Abnormal functioning of the kidney. Neuropathy: Abnormal functioning of nerves. Non-insulin dependent diabetes mellitus (NIDDM): A type of diabetes mellitus in which although the blood glucose levels are higher than normal, they are not immediately life-threatening, and the animal can survive without supplemental insulin. Also called Type II diabetes.Cats can sometimes be treated with pills instead of insulin but dogs always need research. Maybe in time this will change. Pancreas: The organ that makes insulin and enzymes for digestion. Peak: The lowest point or nadir. Refers to the lowest blood glucose point on the bg curve. Plantigrade stance: Standing and walking with the hocks on or almost touching the floor. Postprandial Blood Glucose: The blood glucose level taken 1 to 2 hours after eating. Preprandial Blood Glucose: The blood glucose level taken before eating. Progressive Retinal Atrophy (PRA)- A disease which results in thinning, shrinking retinal cells and central or total blindness. This happens gradually. About PRA, here's where I totally agree with Val regarding getting them to an eye specialist for a baseline which my regular vet did not recomment, but we did it anyway. The eye doctor saw this before Max developed cataracts. Max is not a candidate for cataract surgery as a result of this condition. (from Anne & Max) See also cataracts and dry eye for additional information about eyes. 1. Foods that provide protein include meat, poultry, fish, cheese, milk, dairy products, eggs, and dried beans. 2. Proteins are also used in the body for cell structure, hormones such as insulin, and other functions. Proteinuria: The presence of protein in the urine, indicating that the kidneys are not working properly. Rebound Hyperglycemia: A swing to a high level of glucose in the blood after a low level. See Somogyi effect. Regulation: Using insulin to maintain the blood glucose level of an animal within the acceptable range. blood glucose level above normal. It is also called rebound hyperglycemia or insulin-induced hyperglycemia. Stress-induced hyperglycemia: A condition in cats in which the blood glucose level becomes abnormally high when the animal is stressed, e.g., in the veterinarian's office. Subcutaneous Injection: Putting a fluid into the tissue under the skin with a needle and syringe. Syringe: A device used to inject medications or other liquids into body tissues. The syringe for insulin has a hollow plastic tube with a plunger inside and a needle on the end and units marked on the side. Type I diabetes: A form of diabetes in which so little insulin is produced that supplemental insulin must be given for the animal to live. Also called insulin dependent diabetes mellitus (IDDM). Type II diabetes: A type of diabetes mellitus in which although the blood glucose levels are higher than normal, they are not immediately life-threatening, and the animal can survive without supplemental insulin. Also called non-insulin dependent diabetes mellitus (NIDDM). Unit of Insulin: The basic measure of insulin. U-100 insulin means 100 units of insulin per milliliter (mL) or cubic centimeter (cc) of solution. Most insulin made today in the United States and Canada is U-100. Some countries like Canada there is a U-40 insulin used in pets called caninsulin and requires using a u-40 syringe. Urine Testing: Also called urinalysis; a test of a urine sample to diagnose diseases of the urinary system and other body systems. The teststrip tells you if there is glucose or ketones present in the urine. This website is dedicated to providing up-to-date information for owners of diabetic pets. The site was started back in May of 1997 and was called Diabetes and My Dog Queenie! She contacted me on March 11, 2002 and asked me if I would be interested in taking over her website! animals and where I found help for Queenie back in 1995 and Kris was instrumental in helping me start Queenie's website. She asked if I could leave the website basically intact and it is identical to what it originally was with new additions and all links that no longer fixed were replaced. The internet owes Kris and her courgeous canine Sissy a big vote of thanks for making this one of the first starting places to learn.